Handcrafted in the company's British factory, the Salsa embodies Black Rhodium's pioneering design ethos. Available in lengths of 3m and 5m pairs, Salsa features vibration stabilisation. Earn 949 loyalty points when you order this item. 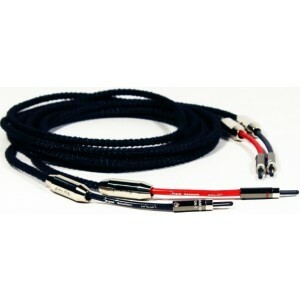 Black Rhodium Salsa Speaker Cable - Terminated Pairs embody the brand's pioneering design ethos by adapting the exclusive features of Black Rhodium's Thunder range. Hand built in the company's Derby factory, the Salsa showcases vibration stabilisers and silicone rubber insulation for an enhanced sound performance. The SALSA applies the brilliance of the GN LEGACYVS-4 Vibration Stabiliser to minimise pesky vibration distortion. The vibration stabiliser reduces audible cable distortion by reducing the vibrations that pass through the conductor wiring and can potentially ruin your listening pleasure. The utilisation of absorbent materials also lessens distortion. The SALSA ensures very fast performance and sharply incisive leading edges to your favourite music and also offers organic, beguiling decays as the notes fade away. SALSA loudspeaker Cables utilise silicone rubber insulation due to its low dielectric loss which offers extremely low distortion due to dielectric absorption effects.